Over the next few days we’re going to update and republish a blog series we did way back in 2013 on important maintenance metrics that you can (and should) track with your CMMS. Don’t want to wait for all the blogs? You can get all this info in one printable document, by downloading our maintenance metrics e-book. First up: Mean time to repair (MTTR). What is mean time to repair? Mean time to repair (MTTR) is the average time required to troubleshoot and repair broken equipment and return it to normal operating condition. It encompasses the time between the start of the incident and the moment the system is returned to production i.e. how long the equipment is out of production. This includes notification time, diagnostic time, fix time, wait time (cool down), reassembly, alignment, calibration, test time, back to prod etc. It generally does not take into account lead-time for parts. MTTR is an important technical measurement for most facilities, since it captures how well an organization can respond to a problem and repair it. 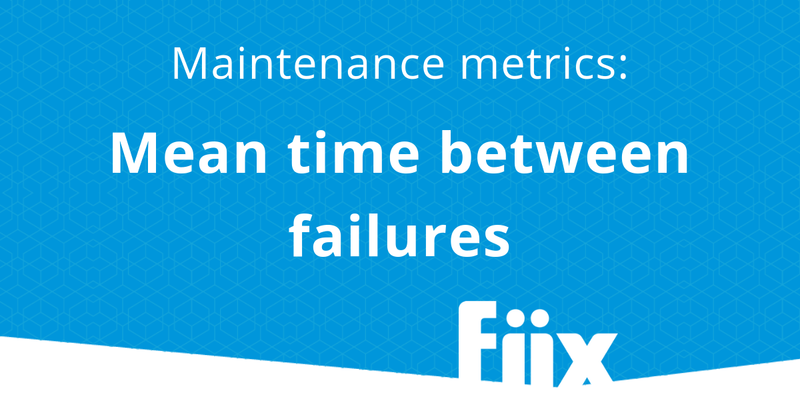 Want to learn more about key performance indicators (KPIs) for maintenance excellence? Read our “Advanced CMMS Metrics” eBook to find out how you can measure them with your CMMS software. Expressed mathematically, it is the total maintenance time divided by the total number of maintenance actions over a specific period. When calculating MTTR, you have to make two basic assumptions: That one technician performs all tasks sequentially, and that properly trained personnel perform the maintenance. Over the lifetime of an asset, each failure will vary depending on the severity of the issue. Some issues will require a simple parts swap while others could take days to diagnose and repair. For mission critical equipment, MTTR can have a dramatic effect on the organization’s bottom line. Taking too long to repair equipment can mean product scrap, missed orders, and soured business relationships. To limit the impact of MTTR, organizations have their own maintenance teams, hold spare parts onsite or run parallel production lines. How do you measure MTTR in Fiix? Every time a system is logged as down for repair in Fiix, the timestamp is recorded in the database. The CMMS software tracks the repair time until the system returns to production. It is then possible to run an MTTR report to see how it trends over time. If you break up the downtime further into sub components such as waiting technician, waiting part, under repair etc., you can extract an accurate calculation of MTTR. What can MTTR tell you? Being able to predict the number of hours that a system or component will be unavailable while undergoing maintenance is vital for reliability and availability studies. MTTR yields a lot of information that can help reliability engineers make informed decisions such as repair or replace, hire, optimize maintenance schedules, store parts onsite or switch parts strategy. For example: As a system ages it may take longer to repair systems. MTTR will trend upwards prompting the repair versus replace decision. You can also use MTTR to predict performance or the life cycle cost of new systems. Equipment manufacturers are now using a modular design philosophy so parts or sub-assemblies can be swapped out quickly and easily. Consider being faced with a purchasing decision that involves 2 similar systems–one has a higher MTTR because repairable items are difficult to remove due to their location. The additional time and costs to maintain should be factored into the life of the system to simplify the purchasing decision. Manufacturers also use MTTR to justify redesigning or improving systems.